These four tech tributes will add a little extra fun to Star Wars Day. It’s not the premiere date of the original film, but the ability to say “May the Fourth be with you” cemented May 4 as the day to celebrate all things Star Wars. Usually, May 4 celebrations online are just simple tributes like pictures or a general acknowledgment of the awesomeness of Star Wars. But some companies and developers go above and beyond the general call to celebrate all things Force-ical and create tech tributes you can actually use. Well, “use” may be too a strong a term. Tech tributes that can actually entertain you is probably a better description. Here’s a look at four of our favorites. As mini-games go Google’s Lightsaber Escape is a lot of fun. Using Chrome on both your PC and phone, it’s up to you to battle your way out of an Imperial ship and on to freedom. You don’t have much in the way of control (you’re constantly moving forward with no chance for retreat) but waving around a lightsaber in first-person mode is tons of fun. Google first released Lightsaber Escape in December 2015. 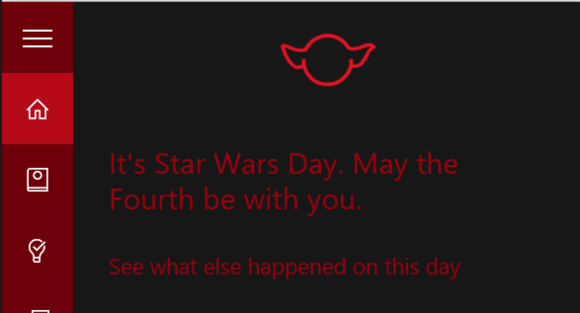 Ask Cortana “What’s up?” today and the personal digital assistant will tell you it’s Star Wars Day. You can also click on a link that takes you to a Bing timeline with more facts about what has happened on May the fourth throughout history. Highlights include former British Prime Minister Margaret Thatcher’s first electoral victory in 1979, and the beginning of the “Freedom Riders” movement in 1961. It wouldn’t be a pop culture celebration without a publicity stunt from everybody’s favorite Troll-in-chief, T-Mobile CEO John Legere. The wireless carrier created a Chrome extension called The DeATTh Star that replaces mentions of AT&T with DeATTh Star and an image of, you guessed it, the Death Star. 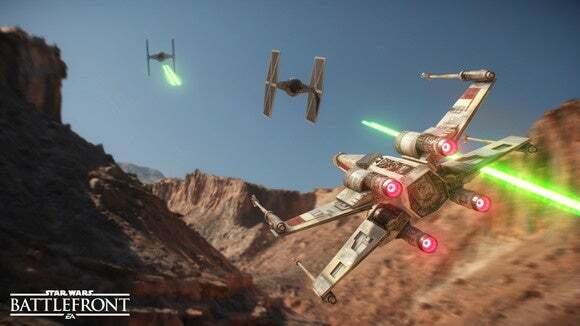 EA wants you to play a little Star Wars Battlefront for free today on PC (sorry console fans).Get Battlefront from Origin to play the base game for free for four hours starting at 11 a.m. Pacific. The free access does not include expansions like the Outer Rim. If Battlefront isn’t your thing, Steam and GOG have a bunch of Star Wars games available at a discount. You can pick up Battlefront II or Knights of the Old Republic on Steam for just $2.50 each instead of $10. GOG has a “saber bundle” for $20 that includes 9 classic games. And for you console gamers, PlayStation Network is also selling a wide swathe of Star Wars games at steep discounts. Now go forth on this Fourth young Padawans and resist giving in to fear, anger, and hate by having fun.